Leptin is an adipocyte-derived hormone that stimulates hypothalamic neurons to strongly inhibit food intake. Leptin signaling in the hypothalamus, a part of the mid-brain, thus plays a crucial role in the regulation of body weight: Leptin resistance, in which leptin signaling is disrupted, is a major obstacle to the improvement of obesity. However, the exact mechanisms underlying leptin resistance in obese patients have yet to be determined. The research group of Professor Masaharu Noda, Associate Professor Takafumi Shintani, and a graduate student Satoru Higashi of the National Institute for Basic Biology (NIBB) demonstrated that protein tyrosine phosphatase receptor type J (PTPRJ) inhibits leptin signaling and that induction of PTPRJ in the hypothalamus is a cause of leptin resistance. They showed that Ptprj is expressed in hypothalamic neurons together with leptin receptors, and that PTPRJ inhibits activation of the leptin receptor through dephosphorylation of JAK2, a protein tyrosine kinase associated with the leptin receptor. 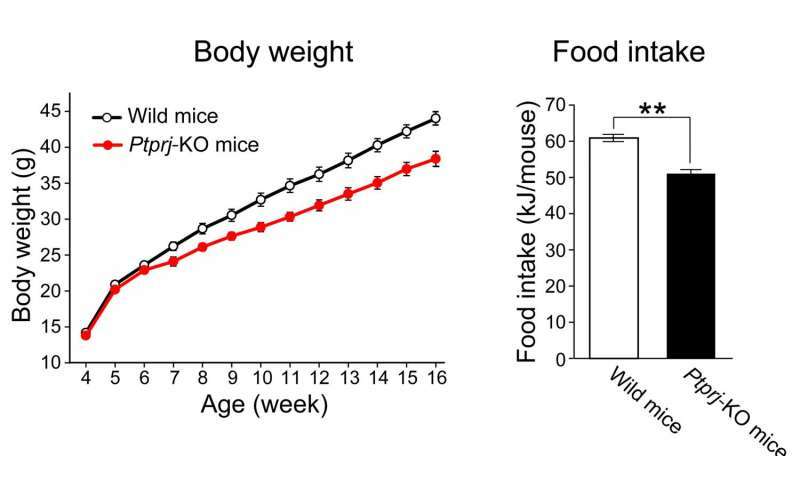 Ptprj-deficient (Ptprj-KO) mice showed no growth retardation, but exhibited lower weight gain due to lower food intake and a lower adiposity, than wild-type (WT) mice. 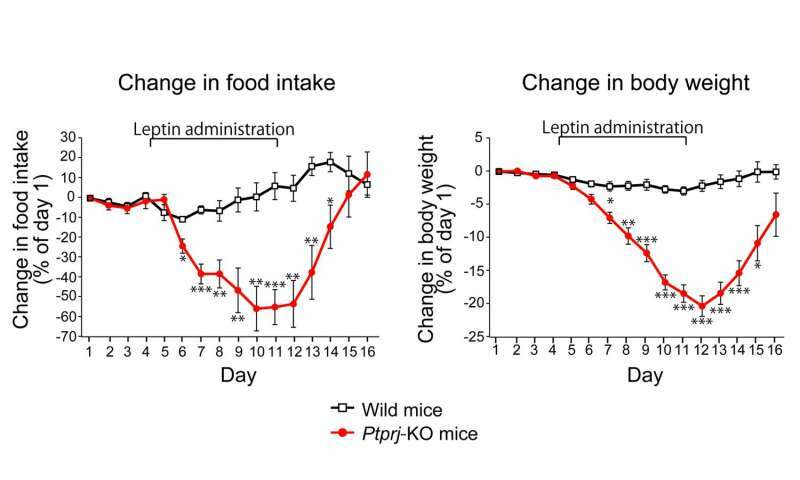 Importantly, PTPRJ expression in the hypothalamus was up-regulated by diet-induced obesity, and, thus, diet-induced leptin resistance did not occur in Ptprj-KO mice. Furthermore, the overexpression of PTPRJ in the hypothalamus induced leptin resistance in lean mice. 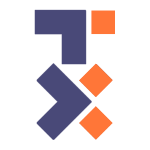 These results strongly indicate that PTPRJ plays critical roles in the development of leptin resistance. 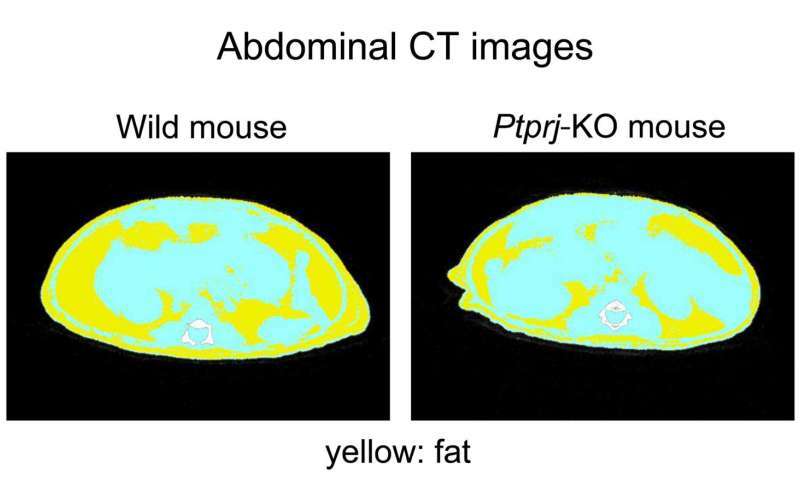 The inhibition of PTPRJ may be a potential strategy for improving obesity.